This tastefully decorated, spacious three bedroom apartment is located in Allentown and a mile away from central downtown. Easy walk to the bars and restaurants in Allentown and Elmwood area. It’s located just a mile away from the peace bridge, leading to Canada and a 20-minute drive to Niagara Falls. Three bedrooms with One Queen bed in each bedroom, a living room, covered balcony with grill, dining room and kitchen. The house consists of a double, two different apartment with separate entrance, however, if you are inclined to use the washers and dryers all the way in the basement that is shared. If you are a larger group, the whole house is available as one listing, you would then have two apartments under the same roof at your disposal. This listing is for the apartment on the first floor. Born and raised in Norway I somehow ended up in Buffalo, NY. I love this town; it has so much to offer and filled with genuine and exciting people. My full-time job is Airline Pilot, so I do have a passion for traveling and seeing new cultures. I believe in doing the right thing and staying positive. The one bathroom on the first floor is a shower in a tub. The second one is located in the basement, just go out the kitchen door, down the stairs and straight ahead. This bathroom is spacious with a regular shower. Thermostat located next to TV in living room. Linens and towels provided. Ekstra towels in the hallway closet on the first floor, and also towels in the closet in the bathroom in the basement. Two Washers and two dryers in the basement, detergent free of charge. I would use the ones furthest away from you when you enter the basement, they are fastest. Plenty of additional towels in the closet in the bathroom in the basement and in the hallway closet on the first floor, just outside the second bathroom. The Kitchen is equipped with what you need for cooking; it is also a Grill on the back balcony. Board games in the cupboard in the kitchen. We spent a weekend here visiting our daughter. Plenty of room and very clean. Very open and bright. Lots of character. Kitchen has everything you need. Three bedrooms with queen size beds and 2 roll always if needed. Plenty of room in living room and dining room. If the weather was nice, you have a big front porch and a back porch that comes off 2 of the bedrooms with a grill on it. 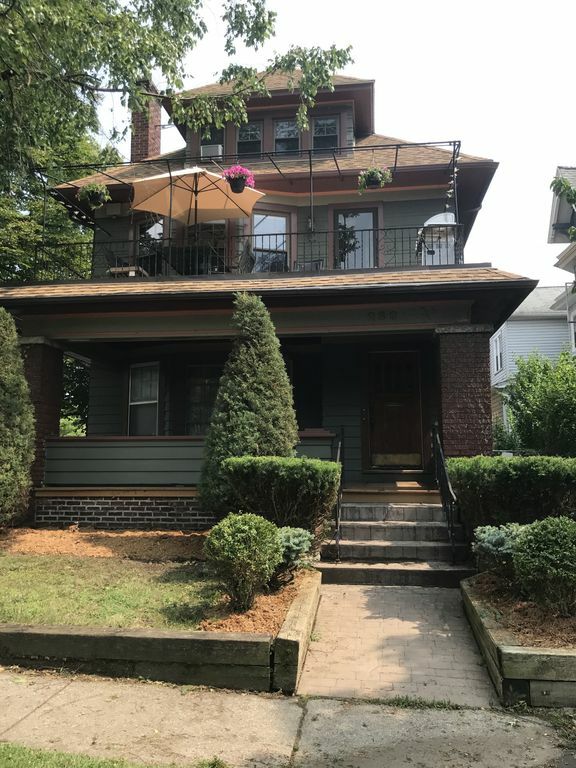 Perfect location to Allentown, Elmwood, downtown and the Peace Bridge. The owner was very accommodating and nice. My only complaint is the water pressure in the shower and no wash cloths provided. Definitely will stay here again! It’s a old house with lots of charm and it’s well kept, I am sorry that the style was not to their liking. As of 8 people, yes, that’s too crowded, and I actually limit the apartment to 6 people. If it’s 6 people everyone will have their own bed, even if it’s no couples in the group. This listing is in a house with two units, I advice to rent the whole house if you are more than 6 people. The whole house rooms up to 18 people total. This was a clean and spacious apartment located a short walk from Elmwood Ave restaurants and nightlife. It was comfortable and stocked with all the essentials. I highly recommend this apartment! Extremely clean & comfortable . It suited our needs perfectly ! Amenities in the kitchen were extremely lacking. No toaster, mixing bowls, whisk or griddle. Grill was empty/no propane so we couldn't grill our burgers. Trash cans and Kleenex would be a nice touch to the bedrooms. We loved the layout with 3 bedrooms and charm. Washer/ dryer was a nice addition. I always encourage communication while staying at any of my properties. My cohost is 5 minutes away, and we respond very quickly to requests/concerns. A quick text and we could have supplied propane within 5 minutes, as we have a spare propane tank in the garage. The stay was in April, and it was still snowing in Buffalo, so we had not cleaned the decks for the season. This apartment is Centrally located downtown Buffalo. One mile from the downtown Center and Shea's theater, walking distance to Allentown, and just two miles from Canalside. Allentown and the Delaware District are two neighborhoods in Buffalo that are located adjacent to each other and north of downtown. These two areas are among the most desirable neighborhoods in the city today, and, much more than most other areas of Buffalo, were able to retain their charm, affluence, and safety throughout Buffalo's dark days from the 1960s to the turn of the millennium. Today, Allentown boasts a thriving cultural and artistic scene and a large selection of bars, restaurants, and funky shops, while the Delaware District is a quiet upscale residential area of stately homes, many of which are of great architectural distinction. Canalside has hundreds of events scheduled throughout the year; there’s something for everyone. Canalside has a ton of free activities; Canalside is the place to be whether you’re looking to unwind, have some fun in the sun or ice skate on the canals. Check out free concerts every Thursday in the summer.